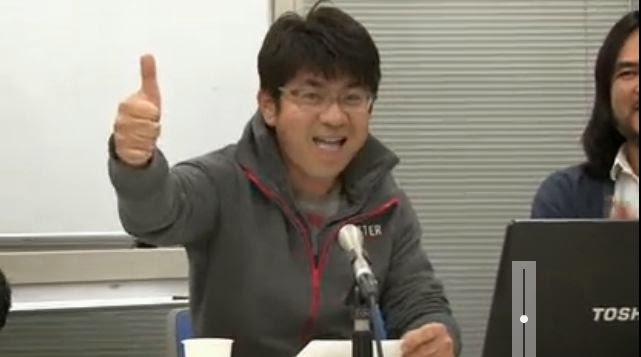 Just wanted to do a quick update to let you know I'm waiting for a full translation of last week's Nico Nico broadcast to do the full blog on what was announced. The major takeaway though was that TBS officially greenlit Sasuke 32. WHOOT!!!! That at least allays the fears of most fans who want this show in Japan to continue. Again I'll update with the questions asked and full report when I have the whole thing done. The show was 2 hours in duration and attended by everyone who was previously scheduled to do so. I was happy that it wasn't interrupted by ads and a solid 1000 people logged in and interacted with the group! An update on current projects I'm working on, I'm still working on videos to update the Rambling Rican in Japan trip from May of this year. Part 3 is up on YouTube and I'm working on Part 4 now. I've also been doing some more research for my book so that's been taking up a lot of my time lately. To that extent a big project has opened up that is now currently in the works that I can't talk about yet but I'm really excited about it!! Once I'm okay to talk about it then I'll do a blog post on it. I'm still continuing with the Final Stage podcast which thankfully has been well received. Thank you! If you are have iTunes and listen to the podcast that way, please help by leaving a rating and/or review. I'd love for more people to be able to listen to the podcast. Also with Sasuke 32 green-lit, my goal is to be able to return to Japan in 2016. The opportunity again has presented itself and at some point I have to figure out how to make that happen again. One option that some have suggested is to open up a Patreon so that it can pace out donations rather than do one big fundraiser. 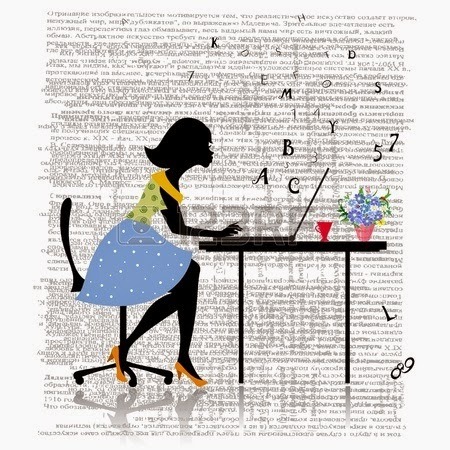 I wanted feedback on that if any of my long-time readers would be interested in that sort of thing. My hope was to be able to do this as a smaller fundraiser paced out throughout the year instead of having a huge zomg fundraiser like Indiegogo. Those are really stressful. I'd prefer to have a smaller IndieGogo to supplement whatever I'm not getting from Patreon. I know the stars would have to align for that to happen but I'm trying to find alternatives. I'm still kicking around the idea and would love feedback. Positive and negative. The goal will remain the same. I will continue doing the blog and update everyone with news from the world of Sasuke, the Sasuke history book is still in production for next year and now the addition would be for a return trip to Japan in 2016. Btw I'm going to be doing a Calendar again this year! For those who remember from last year, I did a 12 month Calendar with various Sasuke competitors. 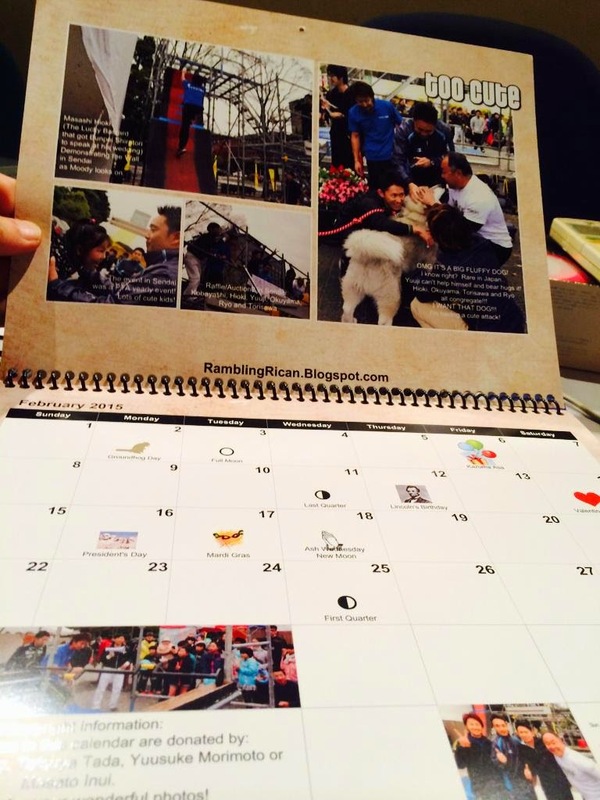 This year's calendar will feature 2015 photos from Sasuke 31 and other events throughout the summer and fall. I hope to have the link up for this year's campaign on the site by no later than November. Today we got some pretty awesome news. It all started out with a few tweets this morning from the Sasuke Director Masato Inui. He was alluding to opening a new Unofficial Sasuke Nico Nico channel with an initial broadcast for Thursday, October 8, 2015. A few hours later he posted the link with exact times and description as to what it was he wanted to do on that channel. Here are the tweets: Tweet One and Tweet Two. For those who are curious.. what is Nico Nico? 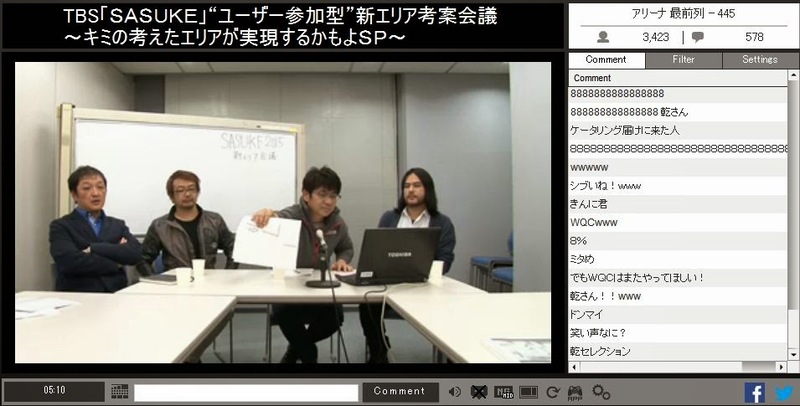 This is the online streaming service that was used during the Sasuke 30 and 31 broadcasts that had commentary on the tournament while it was airing live in Japan. Over the past Sasuke 31 season, it was used often for community updates and additional content. This particular channel is new as this is a channel started specifically by the Sasuke Director himself. I need to reiterate something about the channel. This is not an official channel for TBS. This is his own personal channel and the views and impressions on this broadcast/channel are not the official views of TBS. For those who are unaware, Mr. Inui was hired to direct Sasuke after the collapse and eventual bankruptcy of Monster 9. He is now creative owner for the televised image of Sasuke and he serves not only as Executive Director but sole Editor of the televised show. However, he is President of FolCom and considered to be an outside independent contractor hired by TBS. Remember that while what he discusses about the composition of the show (which he controls), he does not serve as representative of TBS. TBS controls the license of the show and is the only one certified to announce any official plans. He wanted to make sure everyone knew that up front and there are certain answer he is just unable to give since he has limited control of the show and cannot possibly speak for TBS in an official capacity. The hope he has for this informal channel is to provide a monthly update on the world of Sasuke from his perspective and provide an opportunity to engage the community live. Given the format of the first show scheduled, he will be talking to Sasuke stars and answer questions from the live chat pace of about once a month in an informal setting. The title for this month's broadcast is really interesting! Thanks to candh - The broadcast description says: "What'll happen to SASUKE2016!? Full discussions of whether there'll be a big renewal, or is it even possible? 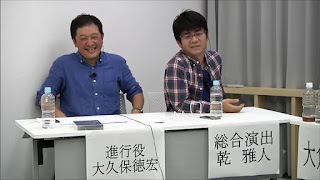 - Unofficial channel by the Sasuke owner, competitors and those involved - planned to do stream every month (just a plan) - someday there may be a live for Sasuke training session"
man does not sleep..) will be discussing the upcoming Sasuke 32, debate how much the show should change (since a renewal of the course is expected after the Morimoto win) with the live audience and live guests. This however does not serve as the announcement for Sasuke 32 as that official announcement has to come from TBS. TBS has not confirmed that nor has it made any official announcement over that. Our hope is that TBS will gauge the success of the social media support from Sasuke 31 (including Worldwide trending during the broadcast and #1 trending in Japan which is not reflected on the ratings for Tokyo) and officially announce Sasuke 32. That said, it hasn't happened yet and he wanted to make sure people knew that. Guests for this month is a who's who in Sasuke. All of this will be hosted/moderated by Sasuke Director Masato Inui 乾雅人 (Sasuke 1-14 and 28 to Present). What is funny is that the last person listed I didn't know who it was.. Thanks to candh for the translation on that last word. 城主 = Joshu, which means a castellan/the lord of castle) is referring to Inui himself. As you can see, it's a joke between Sasuke and MXC/Takeshi's Castle. Side note as well. Most people think that the Japanese refer to Sasuke as Mount Midoriyama (because of an error made by my G4TV when referring to the Studio lot) when in fact it refers the course as the Iron or Steel Castle. So Inui is the Lord of the Castle (meaning Sasuke). I'm really excited as we've been trying to find ways to get Sasuke back into the lexicon of the Japanese youth growing up in an age where television consumption is at an all-time low. We believe that further development of social media will help get Sasuke back out of the slump it is now. I'm really excited that this broadcast will be monthly so we can keep talking about Sasuke even during the off-season. I honestly believe that this will only help the situation. This also is a great indicator that 32 is next year even if it's not officially announced. I'll be blogging about the broadcast each month and hope to provide an English translated update of the topics discussed in a timely manner. It will take me some time to get all of the content translated so I ask everyone for patience for the blog after the broadcast. In the meantime, each month I'll do my best to collect questions from the community (I will be doing this on SMF primarily, however feel free to follow me on Twitter and of course this blog to contact me) and pass that on to the Director. This month may be tight given the short notice, but hopefully we can get a list going in the hopes the topics asked will be at least looked into and answered. Again, there are some topics he cannot formally address as it's either out of his hands, political or he just doesn't know the answer. Just a quick update to let you know that the 6th episode for the Final Stage Podcast with William and I is out! It is another long broadcast. I'm also happy to announce that this and all of our previous podcasts are now officially up on iTunes and on the hosting site of Podbean. The episode went live about half hour ago so it will take a little bit for iTunes to update with the latest episode. It is of course uploaded on Podbean at the same time it goes live on YouTube. 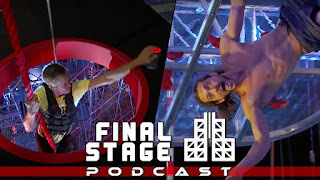 Warning: Episode has spoilers for ANW 7 since at this point the show has aired in the USA and we are discussing the impact of the Series Finale (along with the controversy) and it's connection to Sasuke. If you missed previous episodes of Final Stage Podcast, they are still available on William's YouTube channel and are noted on my sidebar on the right of the blog. I (William) have to be honest; I was not expecting to have this conversation. I thought we were just going to talk about the USA vs The World special and celebrate the fact that anyone around the world can now buy Sasuke 31 merchandise. But not only has USA vs The World not aired yet, but ANW had two people complete its final stage! However, only one person got the cash... and the title of “First American Ninja Warrior”. We have no choice but to talk about this. 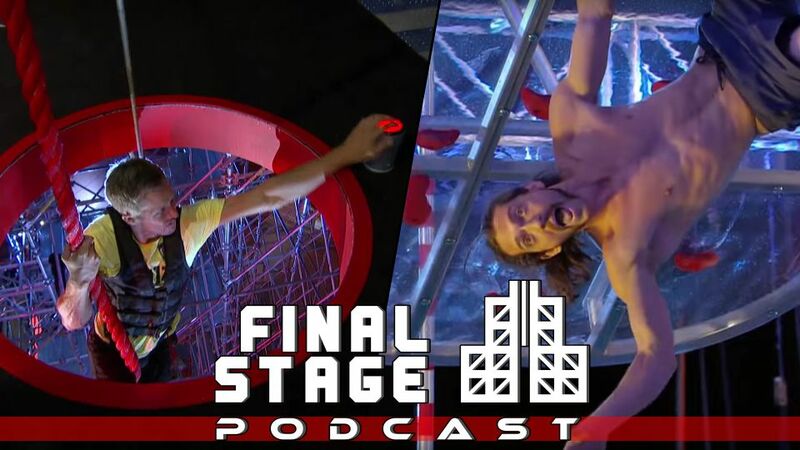 Join us as we break down the season finale of ANW 7 where we talk about their version of the Crazy Cliffhanger, the controversial results of the Final Stage and the very messy fallout. Also, we talk about which Americans will be competing on X Warrior, TBS's views on internet streaming and their handling of Amagi Brilliant Park, William's journey to the location of ANW, Tobal 2, Sasuke video games, and who William thinks should star in a hypothetical US version of Takeshi's Castle. This one was a bit weird, so strap in, folks! 1:20:05 Should ANW pay/respect the competitors more? 1:44:32 Anyone around the world can now buy official Sasuke 31 merchandise via Tokyo Otaku Mode! 1:52:29 So why is TBS selling Sasuke 31 merchandise worldwide when no country outside of Japan has aired it? Also, why have they not tried internet streaming?